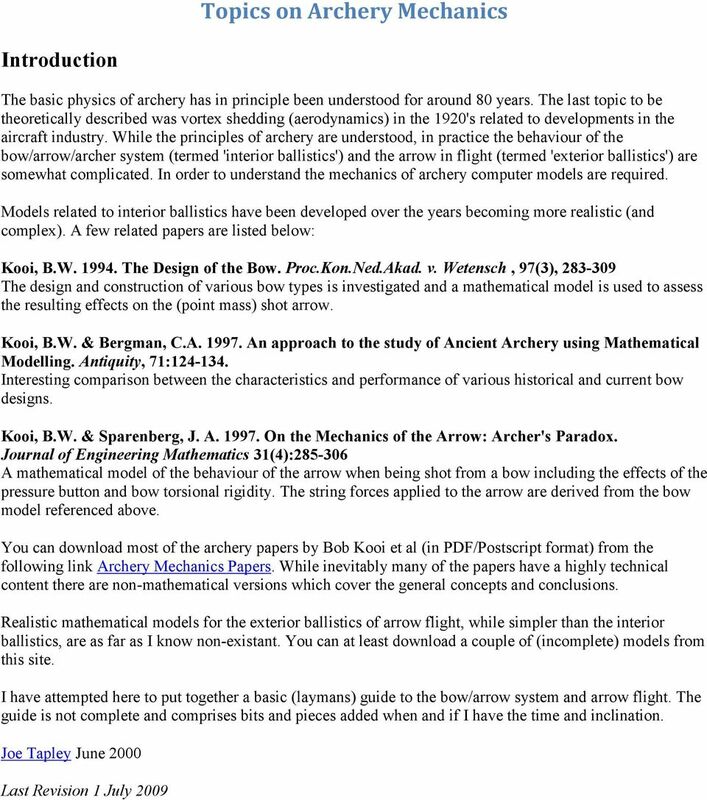 Download "Topics on Archery Mechanics. Joe Tapley"
3 BOW MECHANICS Bow Efficiency And The Concept Of Virtual Mass Defining Virtual Mass Starting with a stationary bow at the brace height position, as you draw it back you store energy in the bow. The area under the force draw curve equals the total energy stored (E t ). When the arrow is released the bow ends up stationary again at the bracing height. The total energy stored has gone somewhere. Most of this energy ends up where you want it as arrow linear kinetic energy (E a ) but the rest (E w )is wasted. The energy equation for the bow is thus: E t = E a + E w The energy efficiency of the bow (F) is defined as the ratio of the arrow energy to the total stored energy. i.e. 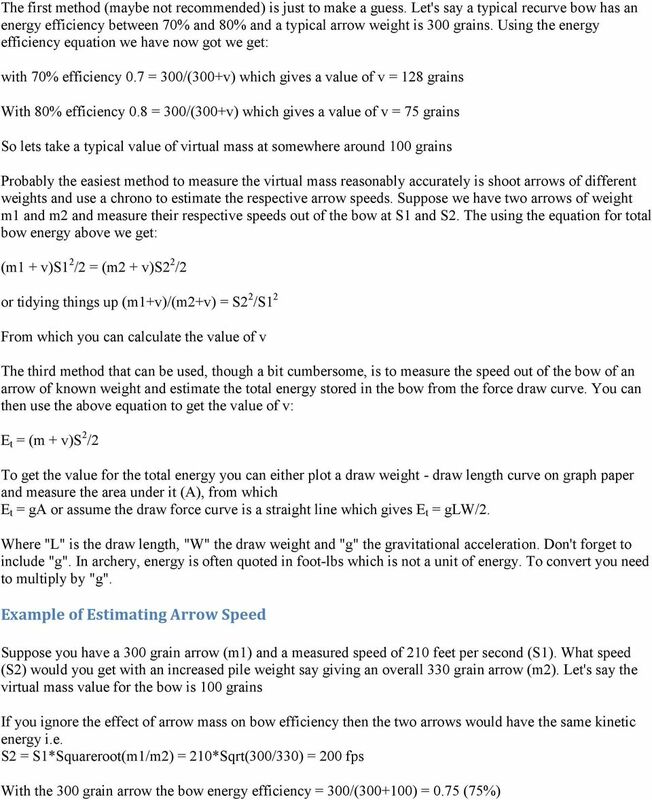 F = E a /E t Supposing the arrow leaves the bow with a particular speed (S) then you can write the total stored energy in the bow as being equal to some imaginary mass (M) travelling at the same speed as the arrow. i.e. E t = MS 2 /2 The value "M" includes the mass of the arrow (m) with the remaining mass (v) called the Virtual Mass. i.e. M = m + v This gives you that E t = MS 2 /2 = (m + v)s 2 /2 = ms 2 /2 + vs 2 /2 ms 2 /2 is just the kinetic energy of the arrow and vs 2 /2 is the wasted energy E w in tems of the kinetic energy of an imaginary Virtual Mass. The bow energy efficiency F = E a /E t thus becomes: F = (ms 2 /2)/((m + v)s 2 /2) = m/(m + v) The bow energy efficiency can be defined in terms of the arrow mass and the value of the virtual mass. 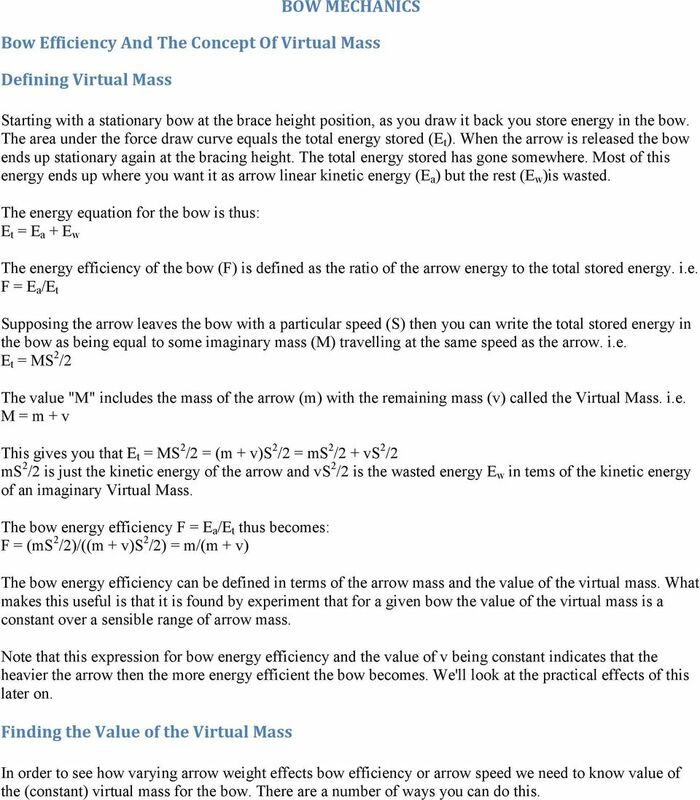 What makes this useful is that it is found by experiment that for a given bow the value of the virtual mass is a constant over a sensible range of arrow mass. Note that this expression for bow energy efficiency and the value of v being constant indicates that the heavier the arrow then the more energy efficient the bow becomes. We'll look at the practical effects of this later on. 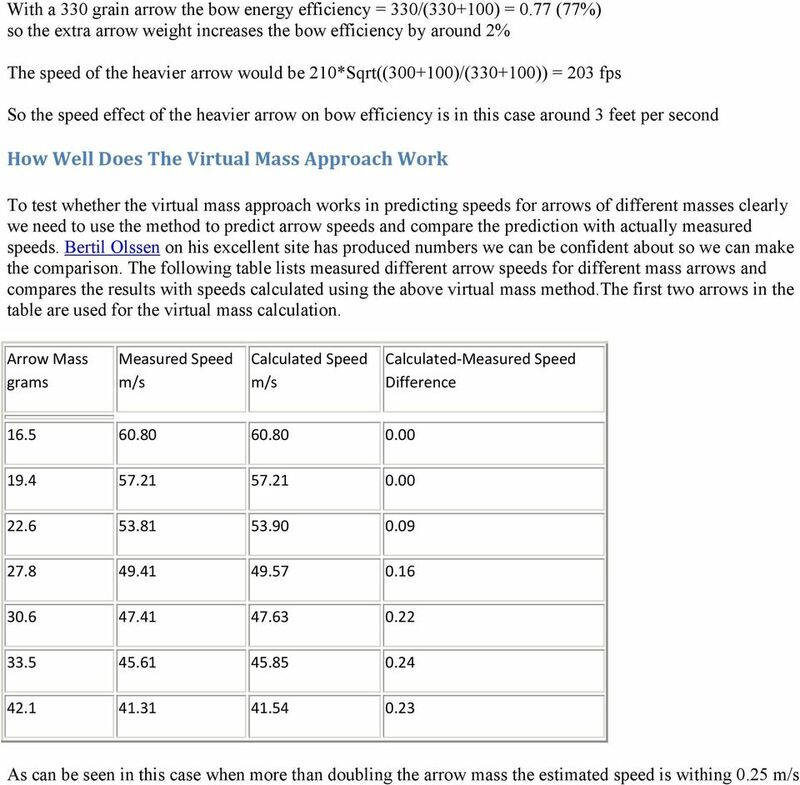 Finding the Value of the Virtual Mass In order to see how varying arrow weight effects bow efficiency or arrow speed we need to know value of the (constant) virtual mass for the bow. There are a number of ways you can do this. 7 not technically allowed to use two reference points. The second reference point is a combination of the head position/consistent anchor point and the 'sight picture'. In the sight picture you can subconciously (or maybe conciously) see the target, the pin, the bow limbs and the string. The archer learns to maintain the same sight picture from shot to shot e.g. the vertical position of the string with respect to the sight pin or bow limbs. 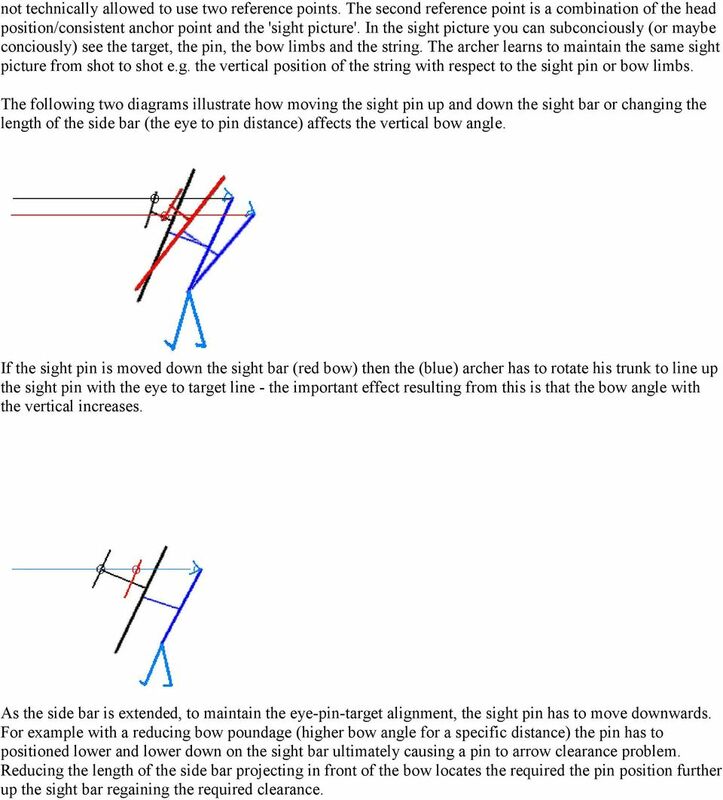 The following two diagrams illustrate how moving the sight pin up and down the sight bar or changing the length of the side bar (the eye to pin distance) affects the vertical bow angle. 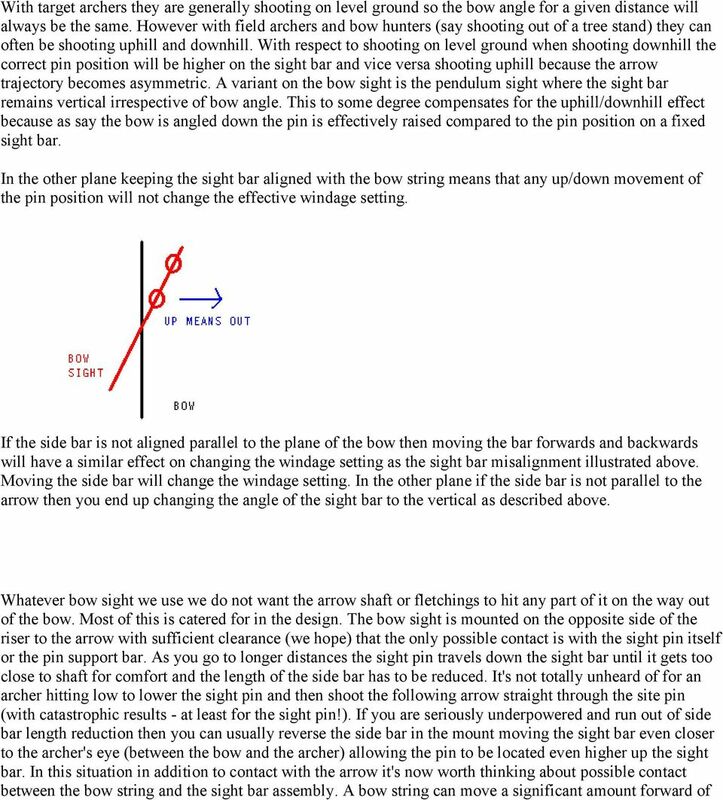 If the sight pin is moved down the sight bar (red bow) then the (blue) archer has to rotate his trunk to line up the sight pin with the eye to target line - the important effect resulting from this is that the bow angle with the vertical increases. 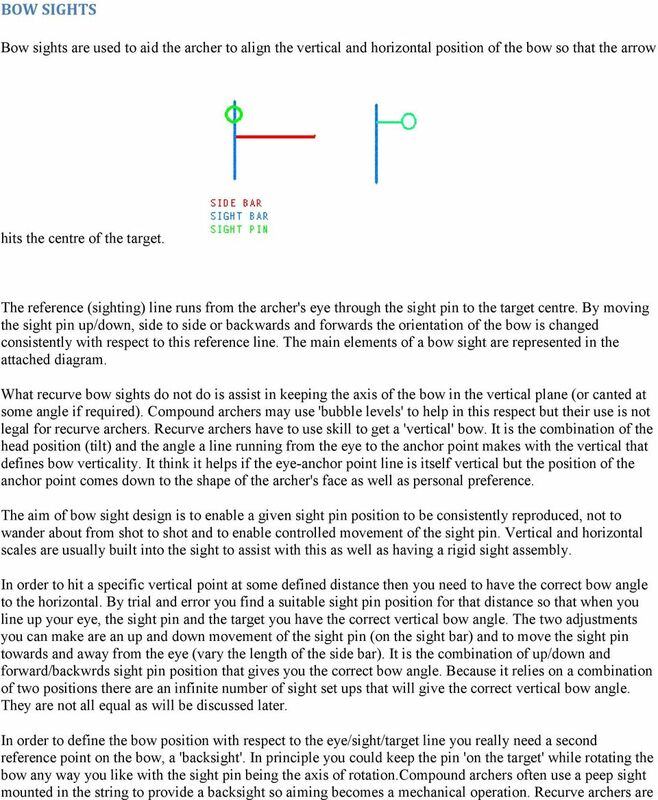 As the side bar is extended, to maintain the eye-pin-target alignment, the sight pin has to move downwards. For example with a reducing bow poundage (higher bow angle for a specific distance) the pin has to positioned lower and lower down on the sight bar ultimately causing a pin to arrow clearance problem. Reducing the length of the side bar projecting in front of the bow locates the required the pin position further up the sight bar regaining the required clearance. 8 Changes in the horizontal angle the bow makes with the direction of the target, the 'windage', is effected by moving the sight pin towards or away from the sight bar and or by changing the length of the side bar. 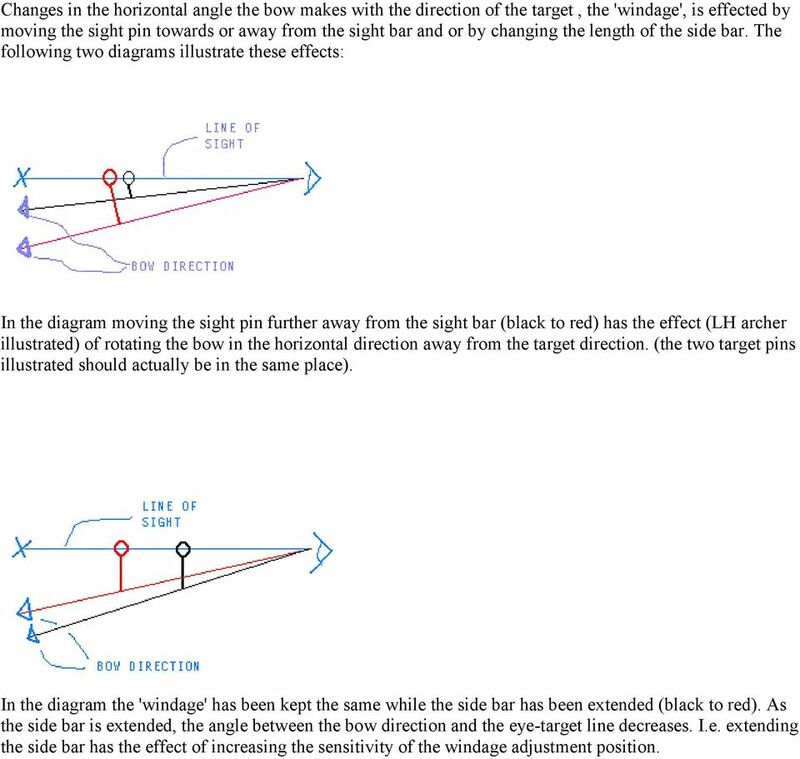 The following two diagrams illustrate these effects: In the diagram moving the sight pin further away from the sight bar (black to red) has the effect (LH archer illustrated) of rotating the bow in the horizontal direction away from the target direction. (the two target pins illustrated should actually be in the same place). In the diagram the 'windage' has been kept the same while the side bar has been extended (black to red). As the side bar is extended, the angle between the bow direction and the eye-target line decreases. I.e. extending the side bar has the effect of increasing the sensitivity of the windage adjustment position. 9 The 'no wind' pin windage setting can be affected by how the archer's anchor point technique effects the eye position. The tuning of the bow will also effect the basic pin windage setting. 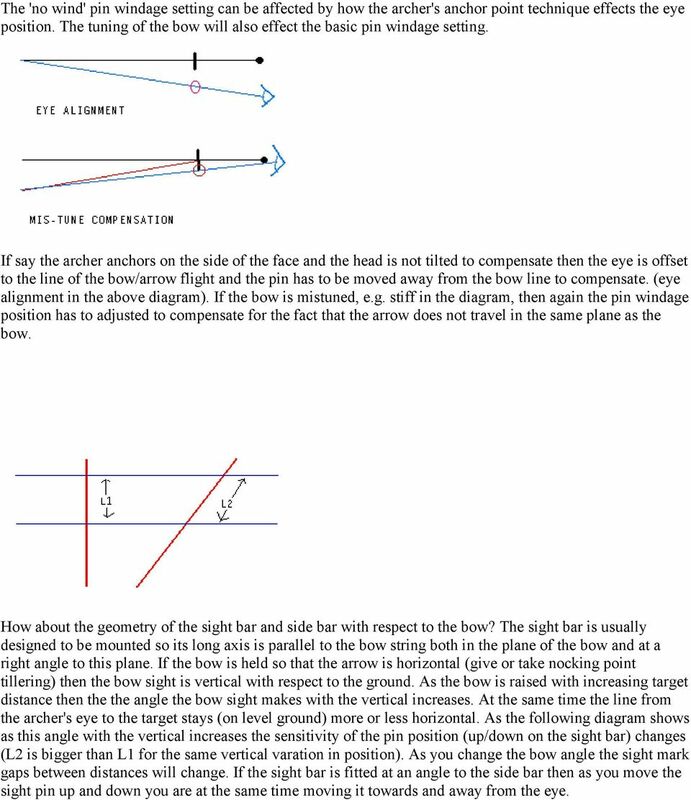 If say the archer anchors on the side of the face and the head is not tilted to compensate then the eye is offset to the line of the bow/arrow flight and the pin has to be moved away from the bow line to compensate. (eye alignment in the above diagram). If the bow is mistuned, e.g. stiff in the diagram, then again the pin windage position has to adjusted to compensate for the fact that the arrow does not travel in the same plane as the bow. How about the geometry of the sight bar and side bar with respect to the bow? The sight bar is usually designed to be mounted so its long axis is parallel to the bow string both in the plane of the bow and at a right angle to this plane. If the bow is held so that the arrow is horizontal (give or take nocking point tillering) then the bow sight is vertical with respect to the ground. As the bow is raised with increasing target distance then the the angle the bow sight makes with the vertical increases. At the same time the line from the archer's eye to the target stays (on level ground) more or less horizontal. As the following diagram shows as this angle with the vertical increases the sensitivity of the pin position (up/down on the sight bar) changes (L2 is bigger than L1 for the same vertical varation in position). 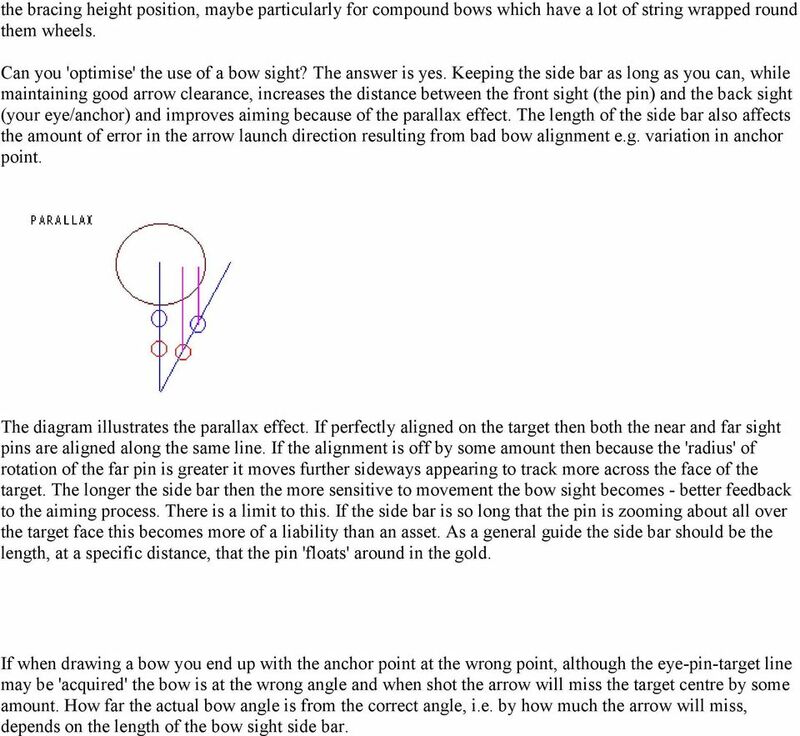 As you change the bow angle the sight mark gaps between distances will change. If the sight bar is fitted at an angle to the side bar then as you move the sight pin up and down you are at the same time moving it towards and away from the eye. 11 the bracing height position, maybe particularly for compound bows which have a lot of string wrapped round them wheels. Can you 'optimise' the use of a bow sight? The answer is yes. Keeping the side bar as long as you can, while maintaining good arrow clearance, increases the distance between the front sight (the pin) and the back sight (your eye/anchor) and improves aiming because of the parallax effect. The length of the side bar also affects the amount of error in the arrow launch direction resulting from bad bow alignment e.g. variation in anchor point. The diagram illustrates the parallax effect. If perfectly aligned on the target then both the near and far sight pins are aligned along the same line. If the alignment is off by some amount then because the 'radius' of rotation of the far pin is greater it moves further sideways appearing to track more across the face of the target. The longer the side bar then the more sensitive to movement the bow sight becomes - better feedback to the aiming process. There is a limit to this. If the side bar is so long that the pin is zooming about all over the target face this becomes more of a liability than an asset. As a general guide the side bar should be the length, at a specific distance, that the pin 'floats' around in the gold. If when drawing a bow you end up with the anchor point at the wrong point, although the eye-pin-target line may be 'acquired' the bow is at the wrong angle and when shot the arrow will miss the target centre by some amount. How far the actual bow angle is from the correct angle, i.e. by how much the arrow will miss, depends on the length of the bow sight side bar. 12 In the diagram 'L' is the length of the side bar, 'D' is the distance from the bow to a perpendicular dropped to the correct anchor point and 'H' is the length of this perpendicular. If the bow is drawn correctly (good anchor point) then when the eye, pin and target are aligned the angle 'A' is defined by the line from the eye to the pin to the anchor point. If say the anchor point is too low (by a distance 'DH') then this angle is increased by an amount 'E'. Any misalignment of the bow can be regarded as a rotation of the bow with the site pin being the axis of rotation. The angle 'E' is the error in the bow angle (how far it is from the correct bow angle). If we assume (we hope!) that DH is small with respect to the length (L+D) then approximately E = DH/P As P = Square Root of (H squared + (L+D) squared) and 'H' and 'D' are essentially fixed it can be seen that the value of 'E' for a given value of 'DH' decreases as the length of the side bar 'L' increases. The longer the side bar the more tolerance there will be to anchor point misalignment with respect to where the arrow hits the target. 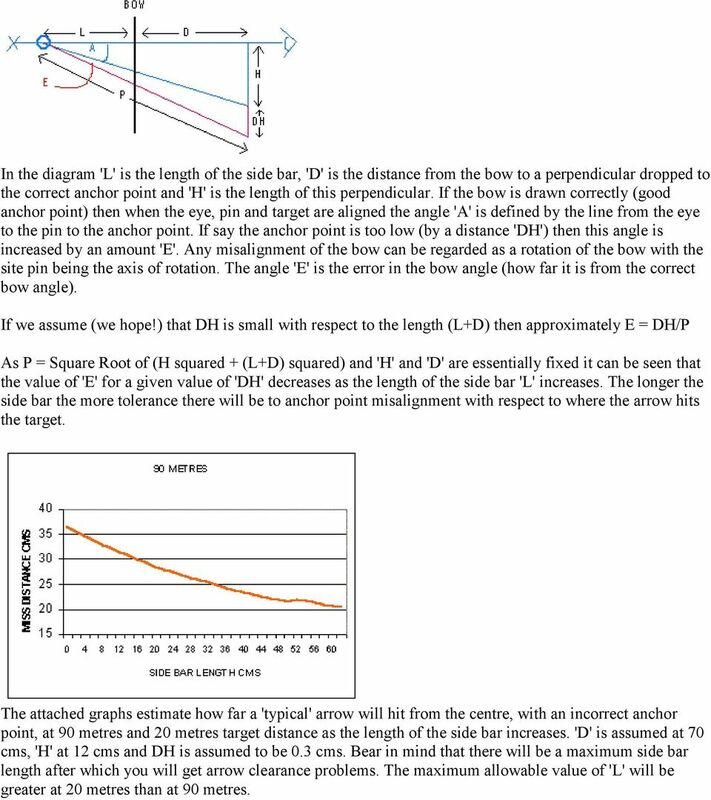 The attached graphs estimate how far a 'typical' arrow will hit from the centre, with an incorrect anchor point, at 90 metres and 20 metres target distance as the length of the side bar increases. 'D' is assumed at 70 cms, 'H' at 12 cms and DH is assumed to be 0.3 cms. Bear in mind that there will be a maximum side bar length after which you will get arrow clearance problems. The maximum allowable value of 'L' will be greater at 20 metres than at 90 metres. 13 For example at 20 metres distance, using a 30 cm side bar the arrrow will hit about 1.25 cms closer to the target centre than if a 12 cm side bar was used. The basic approach to getting the best out of a bow sight is therefore straightforward. Use the longest length side bar you can at any specific distance. This occurs 'naturally' at long distances. At short distances, however, with many bowsights you end up with the pin up near the top of the bow window. If you shoot short distances get a bow sight with the longest side bar that it is practical to use (assuming it maintains adequate rigidity so it doesn't wobble about at full draw). THE DRAW FORCE CURVE As you draw an arrow back on a recurve bow the force on the fingers steadily increases. How the weight on the fingers varies with the amount the arrow is pulled back is called the draw force curve. 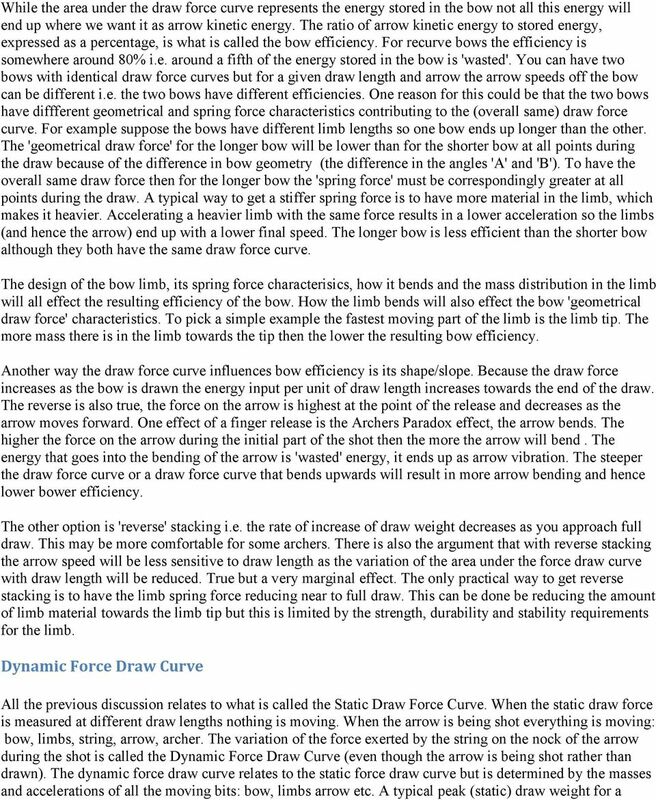 The draw force curve has the following important characteristics. 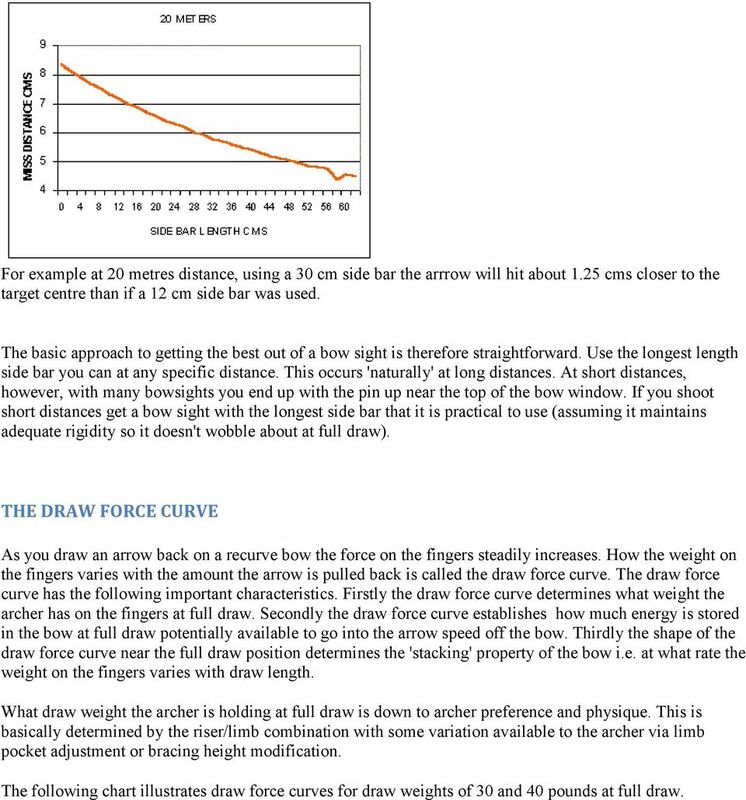 Firstly the draw force curve determines what weight the archer has on the fingers at full draw. 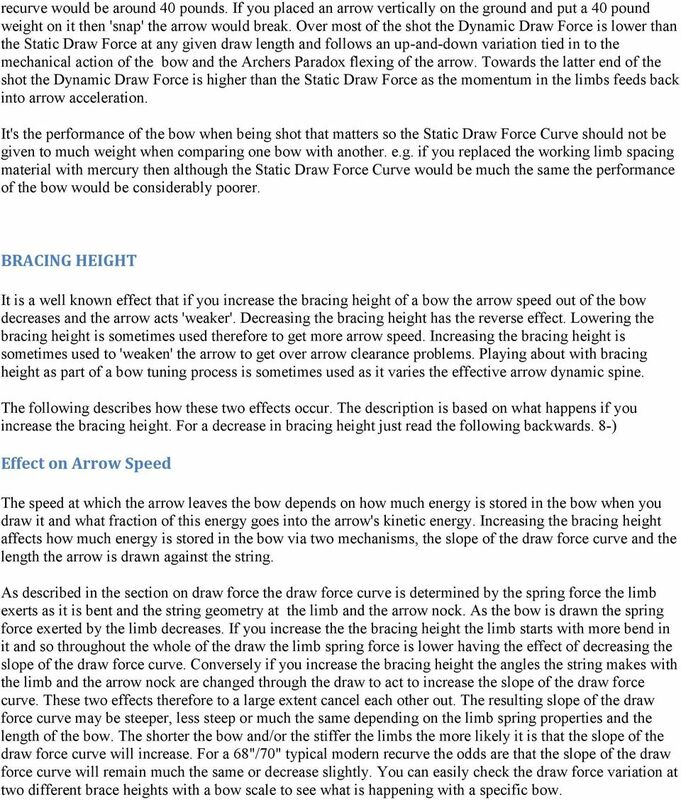 Secondly the draw force curve establishes how much energy is stored in the bow at full draw potentially available to go into the arrow speed off the bow. Thirdly the shape of the draw force curve near the full draw position determines the 'stacking' property of the bow i.e. at what rate the weight on the fingers varies with draw length. What draw weight the archer is holding at full draw is down to archer preference and physique. This is basically determined by the riser/limb combination with some variation available to the archer via limb pocket adjustment or bracing height modification. The following chart illustrates draw force curves for draw weights of 30 and 40 pounds at full draw. 14 The energy stored in the bow limbs potentially available to go into arrow speed is represented by the area under the draw force line (brown for the 30#, blue for the 40# draw weights). 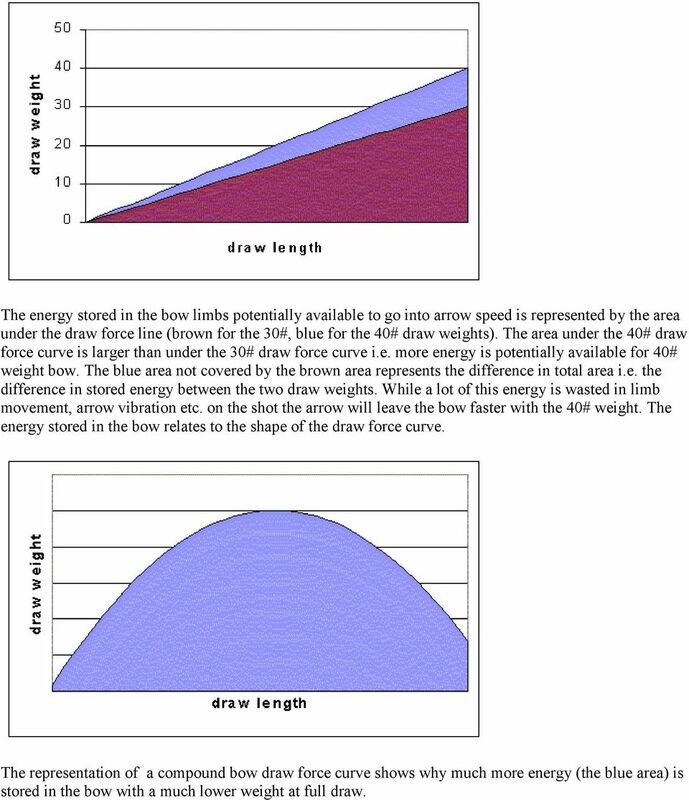 The area under the 40# draw force curve is larger than under the 30# draw force curve i.e. more energy is potentially available for 40# weight bow. The blue area not covered by the brown area represents the difference in total area i.e. the difference in stored energy between the two draw weights. While a lot of this energy is wasted in limb movement, arrow vibration etc. on the shot the arrow will leave the bow faster with the 40# weight. The energy stored in the bow relates to the shape of the draw force curve. The representation of a compound bow draw force curve shows why much more energy (the blue area) is stored in the bow with a much lower weight at full draw. 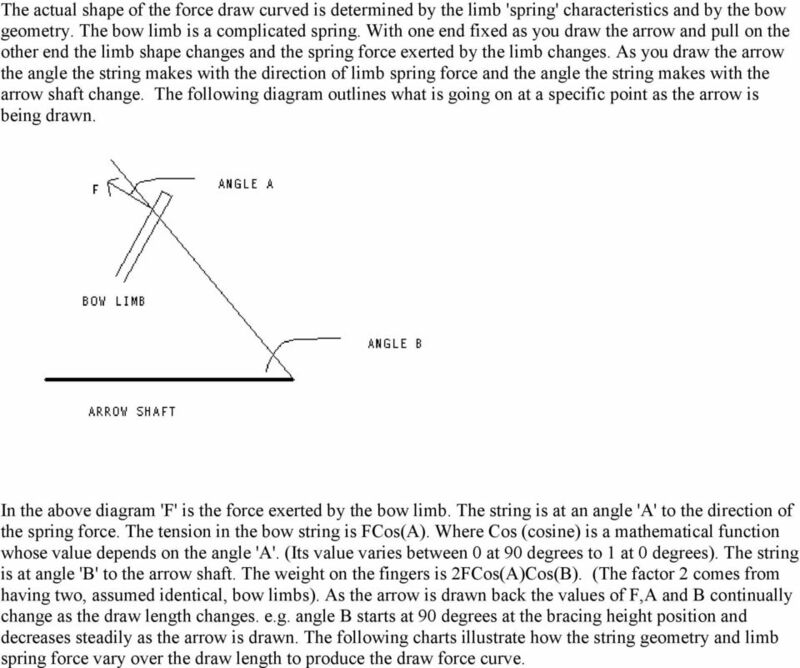 15 The actual shape of the force draw curved is determined by the limb 'spring' characteristics and by the bow geometry. The bow limb is a complicated spring. With one end fixed as you draw the arrow and pull on the other end the limb shape changes and the spring force exerted by the limb changes. As you draw the arrow the angle the string makes with the direction of limb spring force and the angle the string makes with the arrow shaft change. The following diagram outlines what is going on at a specific point as the arrow is being drawn. In the above diagram 'F' is the force exerted by the bow limb. The string is at an angle 'A' to the direction of the spring force. The tension in the bow string is FCos(A). Where Cos (cosine) is a mathematical function whose value depends on the angle 'A'. (Its value varies between 0 at 90 degrees to 1 at 0 degrees). The string is at angle 'B' to the arrow shaft. The weight on the fingers is 2FCos(A)Cos(B). (The factor 2 comes from having two, assumed identical, bow limbs). As the arrow is drawn back the values of F,A and B continually change as the draw length changes. e.g. angle B starts at 90 degrees at the bracing height position and decreases steadily as the arrow is drawn. 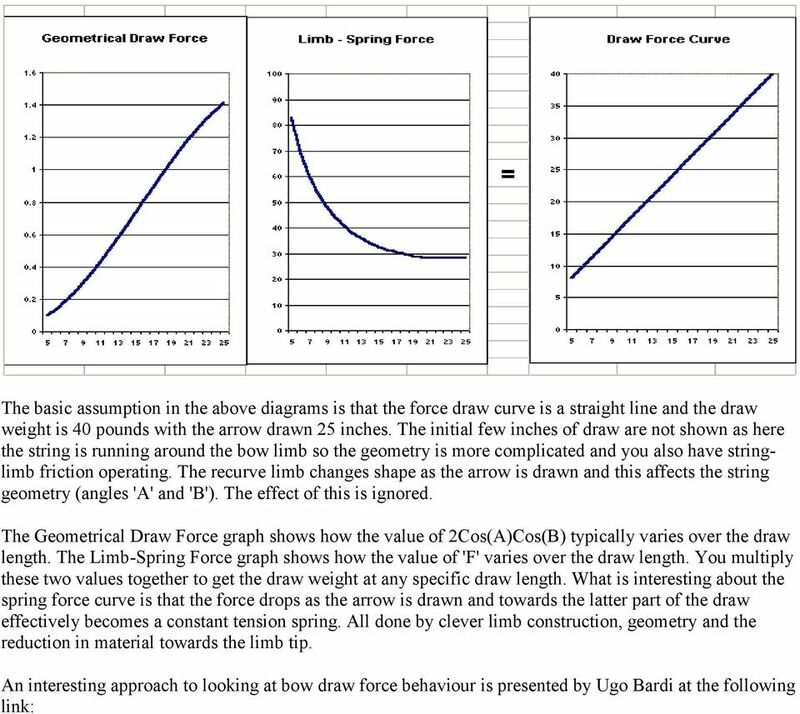 The following charts illustrate how the string geometry and limb spring force vary over the draw length to produce the draw force curve. 17 Look at the draw force curve for any recurve bow and what you see is, more or less, a straight line. 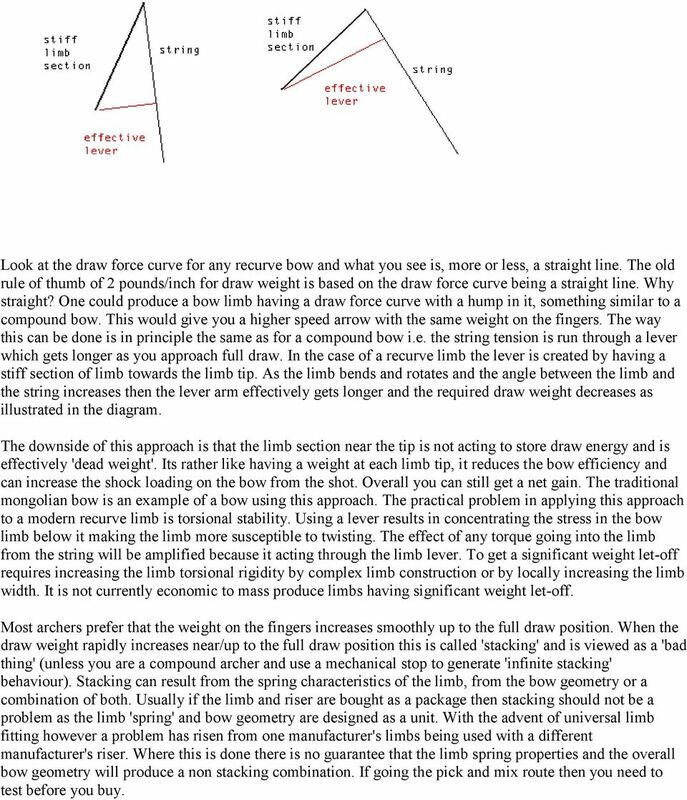 The old rule of thumb of 2 pounds/inch for draw weight is based on the draw force curve being a straight line. Why straight? One could produce a bow limb having a draw force curve with a hump in it, something similar to a compound bow. This would give you a higher speed arrow with the same weight on the fingers. The way this can be done is in principle the same as for a compound bow i.e. the string tension is run through a lever which gets longer as you approach full draw. In the case of a recurve limb the lever is created by having a stiff section of limb towards the limb tip. As the limb bends and rotates and the angle between the limb and the string increases then the lever arm effectively gets longer and the required draw weight decreases as illustrated in the diagram. The downside of this approach is that the limb section near the tip is not acting to store draw energy and is effectively 'dead weight'. Its rather like having a weight at each limb tip, it reduces the bow efficiency and can increase the shock loading on the bow from the shot. Overall you can still get a net gain. The traditional mongolian bow is an example of a bow using this approach. The practical problem in applying this approach to a modern recurve limb is torsional stability. Using a lever results in concentrating the stress in the bow limb below it making the limb more susceptible to twisting. The effect of any torque going into the limb from the string will be amplified because it acting through the limb lever. To get a significant weight let-off requires increasing the limb torsional rigidity by complex limb construction or by locally increasing the limb width. It is not currently economic to mass produce limbs having significant weight let-off. Most archers prefer that the weight on the fingers increases smoothly up to the full draw position. When the draw weight rapidly increases near/up to the full draw position this is called 'stacking' and is viewed as a 'bad thing' (unless you are a compound archer and use a mechanical stop to generate 'infinite stacking' behaviour). Stacking can result from the spring characteristics of the limb, from the bow geometry or a combination of both. Usually if the limb and riser are bought as a package then stacking should not be a problem as the limb 'spring' and bow geometry are designed as a unit. With the advent of universal limb fitting however a problem has risen from one manufacturer's limbs being used with a different manufacturer's riser. Where this is done there is no guarantee that the limb spring properties and the overall bow geometry will produce a non stacking combination. If going the pick and mix route then you need to test before you buy. 19 recurve would be around 40 pounds. If you placed an arrow vertically on the ground and put a 40 pound weight on it then 'snap' the arrow would break. Over most of the shot the Dynamic Draw Force is lower than the Static Draw Force at any given draw length and follows an up-and-down variation tied in to the mechanical action of the bow and the Archers Paradox flexing of the arrow. Towards the latter end of the shot the Dynamic Draw Force is higher than the Static Draw Force as the momentum in the limbs feeds back into arrow acceleration. It's the performance of the bow when being shot that matters so the Static Draw Force Curve should not be given to much weight when comparing one bow with another. e.g. if you replaced the working limb spacing material with mercury then although the Static Draw Force Curve would be much the same the performance of the bow would be considerably poorer. BRACING HEIGHT It is a well known effect that if you increase the bracing height of a bow the arrow speed out of the bow decreases and the arrow acts 'weaker'. Decreasing the bracing height has the reverse effect. Lowering the bracing height is sometimes used therefore to get more arrow speed. Increasing the bracing height is sometimes used to 'weaken' the arrow to get over arrow clearance problems. Playing about with bracing height as part of a bow tuning process is sometimes used as it varies the effective arrow dynamic spine. The following describes how these two effects occur. The description is based on what happens if you increase the bracing height. For a decrease in bracing height just read the following backwards. 8-) Effect on Arrow Speed The speed at which the arrow leaves the bow depends on how much energy is stored in the bow when you draw it and what fraction of this energy goes into the arrow's kinetic energy. Increasing the bracing height affects how much energy is stored in the bow via two mechanisms, the slope of the draw force curve and the length the arrow is drawn against the string. As described in the section on draw force the draw force curve is determined by the spring force the limb exerts as it is bent and the string geometry at the limb and the arrow nock. As the bow is drawn the spring force exerted by the limb decreases. If you increase the the bracing height the limb starts with more bend in it and so throughout the whole of the draw the limb spring force is lower having the effect of decreasing the slope of the draw force curve. Conversely if you increase the bracing height the angles the string makes with the limb and the arrow nock are changed through the draw to act to increase the slope of the draw force curve. These two effects therefore to a large extent cancel each other out. The resulting slope of the draw force curve may be steeper, less steep or much the same depending on the limb spring properties and the length of the bow. The shorter the bow and/or the stiffer the limbs the more likely it is that the slope of the draw force curve will increase. For a 68"/70" typical modern recurve the odds are that the slope of the draw force curve will remain much the same or decrease slightly. You can easily check the draw force variation at two different brace heights with a bow scale to see what is happening with a specific bow. 20 If the bracing height is increased by say 1" then when the bow is drawn the arrow is drawn 1" less against the string and so there will be less energy stored in the bow. (the loss of 1" of draw over the draw force curve you had with the original bracing height). The following diagram illustrates the overall effect. The energy stored in the bow is represented by the area under the draw force curve. 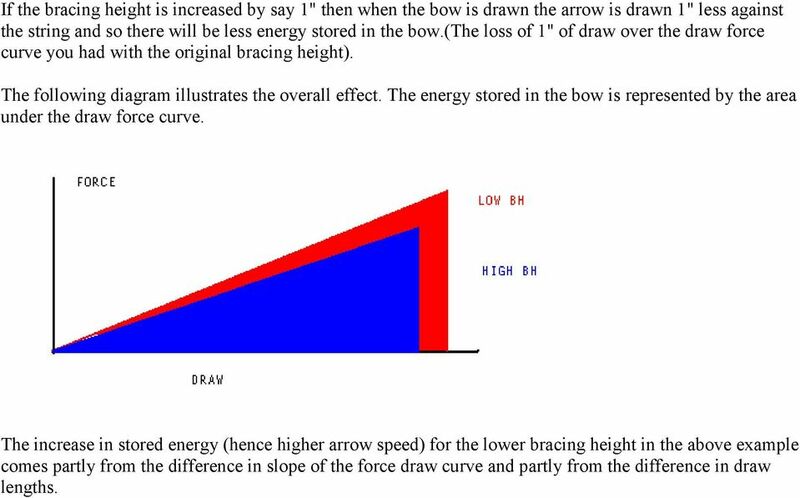 The increase in stored energy (hence higher arrow speed) for the lower bracing height in the above example comes partly from the difference in slope of the force draw curve and partly from the difference in draw lengths. 21 Here (from Border) is a practical example of how changing the brace height affects the draw force curve and hence the stored energy. Also included (the yellow curve) is an example of how the changing the brace height via modifying the riser (deflex) shape can be used to increase energy storage and hence increase arrow speed. The limitation on this approach is that bow torsional stability is reduced and the limbs are more likely to stack. Effect on Dynamic Spine Increasing the bracing height has two effects on the amount the arrow initially bends (its dynamic spine) when it is released. Firstly, as illustrated in the above diagram, it will in general lower the weight on the fingers at full draw. This will have the effect of reducing the amount the arrow bends (stiffer arrow). The second effect is that increasing the bracing height reduces the length of shaft over which this bending occurs and increasing the string force angle to the shaft which has the effect of increasing the amount the arrow bends (weaker arrow). In general the latter effect predominates and the overall effect is to 'weaken' the arrow. 22 How the arrow bends on release is described in the section on Archers Paradox. The section of arrow shaft over which the 'nock end' bending occurs is from the nock end to a point a bit short of where the bracing height is located. ( a 'bit short' as the arrow is moving forward as it bends). If you assume that the amount of 'spring energy' that builds in the shaft until the pile speed catches up with the nock speed is much the same for a small change in bracing height then although the length of bent shaft is a bit shorter, and hence stiffer, the angle between the string force and the shaft is bigger and overall the shaft bends more with the higher bracing height. Another way to put this is to say that as the bracing height increases a lower fraction of the string force goes into compressing the arrow shaft and a higher fraction into bending the arrow shaft. The actual position of the bracing height will affect what effect the string has on the arrow at the point where the string separates from the nock. During the power stroke the bow string is accelerating, pushing the arrow. At some point, determined by the bracing height the string will start to decelerate and the arrow will leave the string behind. The string has to exit the nock groove. How it does this will effect the arrow rotation in the horizontal plane. The higher the bracing height then the earlier will the string exit the nock groove. 23 The ideal situation is when the string direction of travel (the blue arrows) runs straight down the string groove. The string has no effect on arrow rotation. If the brace height is too high the string will exit the nock too early and the direction of string deceleration runs through 'left hand side' of the nock groove. The consequent tweak on the arrow acts to increase arrow rotation in a clockwise direction (looking down on the bow) which makes the arrow act weak. If the brace height is too low you get the reverse and the arrow acts stiff. Generally, because of the way the arrow is flexing and moving, the consequences of having too late a string-nock separation will be worse than having one too early. The tighter the string fit in the nock then the worse will be the consequences of the string not exiting the nock cleanly. The string-nock friction will add to the amount of rotation the arrow gets. This is why the nocking point should be just tight enough not to slide around in the nock groove during the draw. As the diagram illustrates having a short 'V' shaped nock provides a wider tolerance for the string to exit the nock cleanly. 24 In practice nocks are usually keyhole shape; the string is free to swivel inside the nock to prevent string/arrow torque while the "pinch" keeps the arrow from falling off the string during the draw process The effect of bracing height on string-nock separation is not something that the archer need to be directly concerned with. When you select your arrow based on draw length and weight from the charts and use a bracing height in the recommended range this, by definition, gives you good nock-string separation. When you 'tune for groups' you are making small adjustments to how the arrow bends and rotates and getting the best nock-string separation is automatically included in the process. The Relationship between Brace Height and Arrow Speed If you make the assumptions that during the shot the time the arrow is on the bowstring equals the free-free shaft vibration time and that the arrow goes through 0.25 vibration cycles between the nock leaving the bow string and passing the pressure button then you get the relation that the bracing height equals the arrow launch kinetic energy divided by the peak draw force. For example using data from Dennis Lieu A tuned bow system with an ACC 3L-18 arrow had the following measured properties: Arrow mass 341 grain (23.01 grams) Draw Force 169N Arrow launch speed 57.9 metres/second Using the KE/Draw force method with the above data gives a bracing height requirement of 22.8 cms The actual measured bracing height was 22.5 cms Not in itself particularly useful perhaps but rearranging the equation gives you an estimate of arrow speed based on arrow mass, draw force and brace height which might be useful as it only needs numbers that any archer can easily measure. i.e. Arrow Speed squared = twice brace height times draw force divided by arrow mass With the above example and the measured brace height of 22.5 cms the estimated arrow speed is 57.5 m/s. AN IDIOTS GUIDE TO BOW ROTATION No offence is meant by the title. The topic of bow torque, bow rotation and stabilisation is on a realistic level such a can of worms that anyone with any sense avoids the subject like the plague. I'm happy to be included among this group. What I'll try to do here, based on some simplistic examples, is put across some basic concepts about how objects ( e.g.. a bow) rotate when a force (torque) is applied. I shan't go through all the math just supply the relevant relationships. 25 Some Basic Concepts The effect of a force on an object is to change it's momentum. In fact the definition of a force is the rate of change of momentum with time. It follows therefore that the change in momentum resulting from an applied force is the integral over time of the applied force i.e.put simply: change of momentum = force x time In the following I'll use the symbol F for force with suffixes as appropriate. The topic of Moment of Inertia has been covered on another page. The moment of inertia of an object around a particular axis can expressed as being equal to the object mass multiplied by the square of what is called the radius of gyration. The value of the radius of gyration of an object is dependant upon the position of the rotation axis. When you add stabilisers to a bow you to some extent increase the overall mass but what you are really trying to do is increase the value of the radius of gyration. In the following I'll use the symbol M for object mass and K for the radius of gyration with suffixes as appropriate. When you apply a torque to an object it rotates. The angle through which the bow rotates in a time T I'll represent by the symbol A. When you apply a force to an object it changes it's momentum. There are two types of momentum, Linear Momentum and Angular Momentum. In general when you apply a force to an object both the linear and angular momentum are changed. There is a rule about momentum change called the 'Conservation of Momentum Principle' which is basically that momentum can't appear from nowhere or disappear down a black hole. The key to understanding how objects rotate under an applied force is that the changes in linear and angular momentum must simultaneously conform to the Conservation of Momentum Principle. In the following discussion the bow is represented by a vertical black bar. It is assumed that the bow includes various appendages (sight, stabilisers etc.) so that the position of the bow centre of gravity is variable. Free Bow By Free Bow I mean that nothing other than a single applied force (which represents all the accelerating bits of the bow/arrow/string ) acts on the bow. i.e. there is no bow hand. Only bow rotation in the vertical plane is considered. 26 A force F acts on the bow at a distance b from the centre of gravity at C and the assumed axis of the consequent rotation is at R. The distance from R to the bow centre of gravity is a. The centre of gravity is assumed to lie in the plane of the bow. The force is assumed to act for a time T, the time being short enough so we don't have to worry about the value and position of F etc. changing. When you apply the Conservation of Momentum principle as defined above to the bow it defines the point about which the bow rotates and the rate of rotation about this point. The distance a is given by: a = K g 2 /b ( further information) Where K g is the radius of gyration calculated at the centre of gravity C. Several points follow from the definition of a above about the bow rotation axis. Firstly in this case (initially stationary riser and very small value of T) the 'natural' bow rotation axis can never be at the bow centre of gravity as this would contravene the Conservation of Momentum Principle. Secondly the closer the applied force is to bow centre of gravity the further away from C is the 'natural' rotation axis. Thirdly the higher the value of K g the further away from C is the 'natural' rotation axis. (Here rotation axis is taken to mean a stationary point in the current reference frame around which the riser rotates.) Assuming the force F is constant then the angle through which the bow rotates in time T is given by: A = FT 2 (a+b)/2m( K g 2 +a 2 ) No surprises here. The higher the bow mass and in particular the higher the value of K g (lots of stabilisation) the less the bow will rotate in a given time. The closer the centre of gravity is to where the force F is applied then the less rotation you get. If the centre of mass is at the point where F is applied then there is no bow rotation. Research question: How does the velocity of the balloon depend on how much air is pumped into the balloon? My Pictures\Archery\Bow and Arrow Efficiency 2/16/11 Bow and Arrow Efficiency Richard A. Baugh Introduction People have been shooting bows and arrows at animals, targets and each other for over 5,000 years. Simple Machines. What are simple machines? SAM PuttLab Reports Manual Version 5 Reference The information contained in this document is subject to change without notice. The software described in this document is furnished under a license agreement.